VisArts at Rockville, MD is seeking works of art that use new media and technology to eliminate psychological or physical boundaries; and, challenge a gallery's role as mediator between artworks and viewers. New media and technology have the power to eliminate conventional, artistic boundaries. Interactive art, for example, encourages viewers to complete the artwork by actively transforming it visually and conceptually. Artwork can be exhibited remotely, with only the concept (rather than the physical object) in a gallery. Likewise, a viewer may experience a work of art even if they are not in the gallery with the object. Works considered: Artwork with at least one component that uses an electrical and/or battery power source, and created in the past three years. The work does not have to be a physical, gallery object. For more information or to apply, go to www.visartscenter.org and click on the link in the Exhibition menu. One of the District's best-known, most collected and most widely admired artists is the amazing Manon Cleary, and next July 22, at Addison Ripley in Georgetown, from 5-7PM, she has an opening reception for a new exhibition of her latest pastels. For more than thirty years, Ms. Cleary's often disturbing drawings and paintings have brilliantly represented her personal world in provocative, unflinching and iconic terms. A 2008 exhibit at the Kalamazoo Institute of Arts referred to Ms. Cleary as "one of the leading American figurative artists of the past three decades". 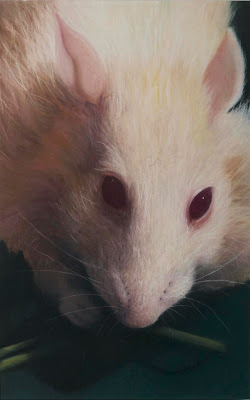 This exhibit at Addison/Ripley pairs gentle sky "portraits" with pictures of strangely engaging white rats. Each of the works from Rats and Skies, is developed by hand on sanded paper with an unmatched mastery of materials and technique. In addition, the gallery will present earlier work by the artist, including examples from her "Movement Series". Cleary's ongoing contribution to the art world in Washington is extensive and keeps on going despite severe health issues that have limited her ability to work. Don't miss this show; I won't.